A gripping, action-packed short story available only as an eBook—from a master of character, crime, and urgent suspense. Will Trent, a dedicated agent with the Georgia Bureau of Investigation for fifteen years, knows that there’s definitely such a thing as a cop’s intuition. Which is why he should have listened to his own. While in an airport restroom at Atlanta’s Hartsfield-Jackson International, Will overhears a girl’s pleading, plaintive voice: “Please, I wanna go home.” Something isn’t right here, thinks Will. He feels it in his gut. But he waits too long to act, and now the girl and the anxious, angry man she’s with have disappeared into the crowds at the busiest passenger airport in the world. After a desperate search and with time running out, Will makes a call to his supervisor, Amanda Wagner. Will’s partner, Faith Mitchell, immediately sends out an abducted child alert. The entire airport will soon be grinding to a halt: Almost 100 million passengers a year. Five runways. Seven concourses. Six million square feet of space that sprawled across two counties, three cities, and five jurisdictions. All shut down on a dime because Will has a hunch that he is certain is true: a girl, maybe six or seven years old, has been snatched from God knows where. And he intends to bring her back—no matter what it takes. 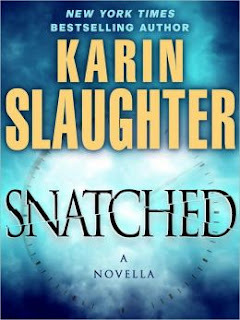 Includes an exclusive excerpt from Karin Slaughter’s thrilling new novel of suspense, Criminal. Karin Slaughter is the New York Times and #1 internationally bestselling author of twelve thrillers, including Fallen, Broken, Undone, Fractured, Beyond Reach, Triptych, and Faithless. She is a native of Georgia. I love the way Karin Slaughter writes. I love that she pushes me from one page to the next. I get so driven by the horrendous storyline in her books. She's got a diabolical mind and it's fantastic to read what she can put down on paper. This novella is no exception. So sharp and piercing! She can get in the mind of her characters and speed up your heart rate while she takes you on a psychological ride with them. In this story, Slaughter's protagonist, an agent on a boring, sleazy mission, inadvertently comes upon a kidnapping in action. As his instincts kick in and he identifies the child and abductor, we are completely absorbed in his pursuit. The agent becomes psychologically connected to the abducted child and we experience his angst from one moment to the next while he tries to find her in time...before she's molested or killed. Slaughter engenders our sympathies toward him, and our disgust toward the perpetrator. She's a master manipulator of our feelings. This little novella moves at lightening speed and I found myself searching my brain trying to figure out all the clues to get to the child in time, myself. You'll love to read the book in one sitting!